Product Close-up Visit The Story Store! The "Greatest Story Ever Told" is more than just a cliché. God goes to great lengths to rescue lost and hurting people. That is what The Story is all about—the story of the Bible, God’s great love affair with humanity. Condensed into 31 accessible chapters, The Story sweeps you into the unfolding progression of Bible characters and events from Genesis to Revelation. Using the clear, accessible text of the NIV Bible, it allows the stories, poems, and teachings of the Bible to read like a novel. The story of the Bible—in its own words. 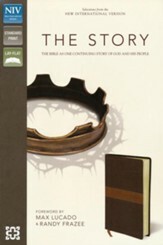 Bible selections from the NIV, 2011 update, with short transitions connecting you to the continuing story. 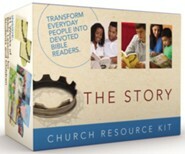 Church families around the globe can now embrace The Story for a full ministry year through worship, small group studies, and family activities. THE GREATEST STORY EVER TOLD" IS MORE THAN JUST A CLICH&Eacute;. God goes to great lengths to rescue lost and hurting people. 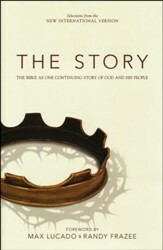 That is what The Story is all about: the story of the Bible, Gods great love affair with humanity. Condensed into 31 accessible chapters, The Story sweeps you into the unfolding progression of Bible characters and events from Genesis to Revelation. Using the clear, accessible text of the NIV Bible, it allows the stories, poems, and teachings of the Bible to read like a novel. And like any good story, The Story is filled with intrigue, drama, conflict, romance, and redemption; and this storys true! From the foreword by Max Lucado and Randy Frazee: "This book tells the grandest, most compelling story of all time: the story of a true God who loves his children, who established for them a way of salvation and provided a route to eternity. Each story in these 31 chapters reveals the God of grace---the God who speaks; the God who acts; the God who listens; the God whose love for his people culminated in his sacrifice of Jesus, his only Son, to atone for the sins of humanity." 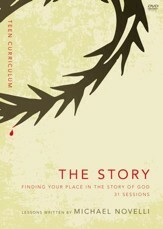 Learn more about this whole-church experience at TheStory.com. 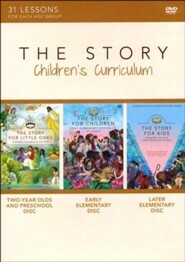 Q: Age group for "The Story" I have a childrens ministry ages 3-12. Would this be an appropriate gift for the children old enough to read? This edition would work for older Elementary age children to Adult. 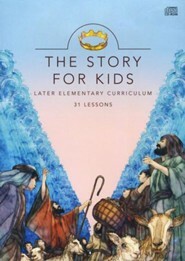 For an edition of this Bible geared specifically for kids see WW719755, The Story for Kids. Q: Are the events in this book in chronological order or in books of the Bible order? 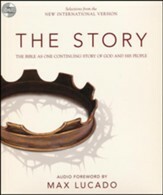 The Story presents selected passages from the NIV in Chronological order. Q: Can I look up a specific scripture reference in The Story? My homeschooled 9th grader is using a curriculum which requires extensive scripture reading. I think The Story would be helpful. My only question is this...if he is assigned to read Proverbs1-20, is there an index that would help him know what pages to read in The Story? Thank you for any experience and help you can offer. No, there are no chapter/verse references in the text of "The Story". There is a Chart of References in the back noting which selections of the Bible are used for each chapter of the book. Q: We give Bibles to people that we don't always know personally. Would this be appropriate for a teenager that may not have a Christian background? This would be easier reading for a young person not familiar with the Bible. Q: What is the difference between this and the other edition? What is the difference (in content) between this and "The Story: Read the Bible as One Seamless Story from Beginning to End" (CBD Stock No: WW936985 / ISBN: 0310936985)? This version utilizes the NIV's 2011 update which brings the language more in line with today's vocabulary. Q: What kind of binding is on the hardcover edition, is it sewn or glued? This is a glued binding. Q: Which version of the NIV is used in this study? 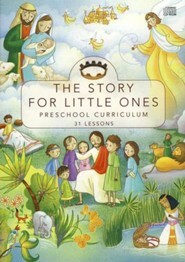 This uses the 2011 edition of the NIV. 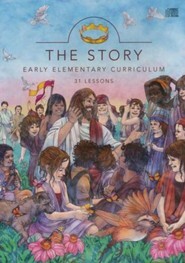 I'm the author/artist and I want to review The Story Bible, NIV.